14 years later we're dropped back into the middle of some incredible action. I remember being 8 years old and heading to see the first edition of this movie in cinema, however, I haven't watched it since so I barely remember much of the plot, therefore, this review won't be in comparison or relation to the first. This sequel could easily be a stand alone film and I see it copying the success of its Oscar winning counterpart. The script was brilliantly funny and had a screen full of grown adults laughing their heads off. I got to see this courtesy of Cineworld's Secret Screening, a film you head into not knowing what it is until the BBFC card appears on screen. The moment the title was revealed there were cheers and whoops (an achievement the previous two secret screenings did not earn). 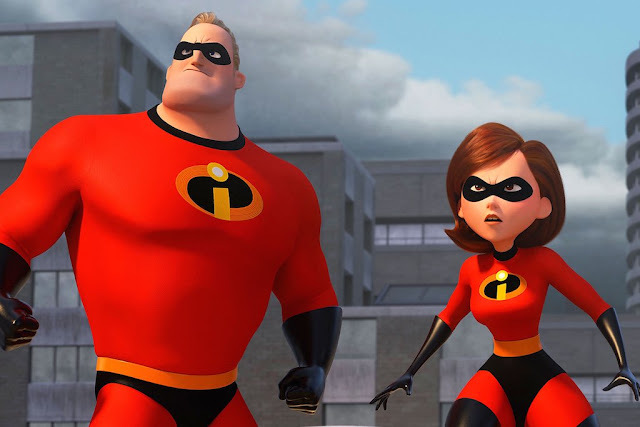 I love being in a cinema where the energy is palpable and Incredibles 2 did just that from the fast paced opening action scene, right through to the end. You could feel the delight everyone felt from the comedic moments as well as the genuine sincerity gained through the audible aww moments. One thing I love in a film is a great score/soundtrack and Michael Giacchino's score did not disappoint, there were multiple moments where I fell out of the narrative and just thought to myself "wow, this music is impeccable" it bought to life every single emotion and tied in perfectly with the mis-en-scene. The visuals were just beautiful and that extensive list of VFX artists did not go to waste. There's a moment where *mini spoiler* Elastagirl comes face to face with a villain *end spoiler* that is so beautifully crafted on screen. It puts you inside the moment and makes you feel a part of the action. It truly put everyone on the edge of their seats. It felt like it could easily be played out by real people, mimicking that of a Marvel movie with the action being so realistic that it feels it could happen on any street in the world. It certainly had me on board throughout the entire thing and I wasn't even one of the people overly excited about its release so I think those die hard Incredibles fans are going to just love it. I have it on good authority from the cinema full of people clapping when the credits rolled. A quick warning for this film, however, one not classified before the film begins: this film isn't friendly for people with epilepsy. There's two moments that could trigger it and I'd recommend having somebody with you who's already seen it to warn you or to not go. Incredibles 2 is in cinemas July 13th.